JY Yang continues to redefine the limits of silkpunk fantasy with their Tensorate novellas, which the New York Times lauded as "joyously wild." In this third volume, an investigation into atrocities committed at a classified research facility threaten to expose secrets that the Protectorate will do anything to keep hidden. Something te JY Yang continues to redefine the limits of silkpunk fantasy with their Tensorate novellas, which the New York Times lauded as "joyously wild." In this third volume, an investigation into atrocities committed at a classified research facility threaten to expose secrets that the Protectorate will do anything to keep hidden. To ask other readers questions about The Descent of Monsters, please sign up. Can I read this book without having read the first two in the series? In the past two books, I've struggled a bit with feeling as thoug Out of the three Tensorate novellas I have read, this one is definitely my favorite. While I didn’t originally intend to read this for BookTube-a-Thon 2018, it fits one of my challenges & I happened to read the whole thing on day one so I’m counting it! Challenge: Read a book with green on the cover! The Descent of Monsters is the third novella in the silpunk fantasy series Tensorate. It does not follow the twins anymore, not directly, and it's told completely through letters, parts of diaries and reports. I didn't like this novella as much as the first two books, for two main reasons: the format, and the main character. One of the things I liked the most about the first two books was the atmosphere, especially the description of the setting. Because of the format, I didn't get many 3.5 stars. One of the things I liked the most about the first two books was the atmosphere, especially the description of the setting. Because of the format, I didn't get many of them here, and this book has a completely different tone from the first two - it's almost horror, but not my kind of horror. Reading about terrifying megafauna was great, but everything about it felt distant because of the way this book was written, and horror should not feel distant. What I liked about the megafauna experimentation aspect, apart from the fact that there are dinosaurs and of course I appreciate that, is that it really makes you wonder who are the monsters. I do get why this book was told from her PoV - (view spoiler)[every rebellion has casualties (hide spoiler)], but that's a point of view we rarely get, so much that we're used to them being expendable characters in fiction. What saved this book for me were the side characters. I loved seeing Akeha again - I love them so much [they started using they/them pronouns in this book because they realized they could after meeting Rider. They started using he/him in the first book because of societal pressure. I love reading about characters figuring themselves out] - and Mokoya is still awesome, even if she's barely there. Rider's diary and quest were also what I was really invested in while reading this story. I wish I could have cared about Sariman just as much, but that didn't happen. The format was a little more difficult to get into than the previous novellas, and made the story a little more impersonal, but it was still wonderful and I enjoyed it immensely. My favorite Tensorate novella so far: the prose is smoother and more elegant than in the previous installments, the plot tight, and, most importantly, Yang skillfully pulled off a challenging narrative structure of scattered fragments and documents. It's just so good and bold and chilling. Another cracking novella in the Asian-fantasy-rooted Tensorate world. These really are terrific; when will we get a novel expanding on it all? (she says greedily). This one is creepy, vivid, super immersive, and opens out the sinister world in a fascinating way while updating us on the MCs of the first books. Also, the covers are just absurdly good. Terrific. Perhaps my least favourite in the series. Not a fan of the letter/report format either, not with this kind of story and worldbuilding. There’s something limiting in having one character recounting only things she/he/they witness. You can’t help but feel there’s something you’re missing or not fully experiencing. Plus, the ending was a bit predictable in an every-rebellion-needs-its-martyrs kind of way, and the new main character was one-dimensional. I am quite sad that I cannot rate this higher. Perhaps my least favourite in the series. Not a fan of the letter/report format either, not with this kind of story and worldbuilding. There’s something limiting in having one character recounting only things she/he/they witness. You can’t help but feel there’s something you’re missing or not fully experiencing. Plus, the ending was a bit predictable in an every-rebellion-needs-its-martyrs kind of way, and the new main character was one-dimensional. I am quite sad that I cannot rate this higher. But this will not turn me away from J.Y. Yang as a writer. I definitely will read everything they put out because you can sense their potential. I liked this series as a whole for the natural way in which they discuss gender and I think more writers should take note! This was amazing, I liked the first two novellas a lot, the second even more, but THIS ONE topped them in a way I wasn't even expecting. Though they're a whole, a series, and I wouldn't have enjoyed this one without the worldbuilding being set in the previous ones and the background characters present here. I love how JY Yang managed to change things up in this third instalment with the format of letters, reports and journal entries. I also LOVE Chuwan and can't wait for everyone to meet this intense dramatic and fun investigator in the face of the horrors she'll unravel. All of these novellas are so lovely and SO different from each other. It’s awesome. My only confusion was Akeha’s pronouns- I was sure they were a “He” in previous books? Either I misinterpreted the first 2 or I missed a change, So clearly I need to reread them. Oh this was brilliant and so engaging. I have to praise Yang for keeping the Tensorate stories fresh with new perspectives, as this time we follow the investigation into a tragic event that happened at a research facility through a variety of reports and personal letters. It brings something new to the stories and work really well as a means to tell us more about the characters connected to Akeha, Mokoya, Rider, and the others we’ve met. I can’t wait for the fourth book now! Eta: Yang confirmed t Oh this was brilliant and so engaging. I have to praise Yang for keeping the Tensorate stories fresh with new perspectives, as this time we follow the investigation into a tragic event that happened at a research facility through a variety of reports and personal letters. It brings something new to the stories and work really well as a means to tell us more about the characters connected to Akeha, Mokoya, Rider, and the others we’ve met. I can’t wait for the fourth book now! Took me a little while to get into the story because of the Found Materials format, but once I got past that it was a brilliant read. Expertly woven together, and expands the scope of the world even further. Can't wait for book 4! The first two books (The Red Threads of Fortune and The Black Tides of Heaven) introduce you to a world and a setting without making it essential to have read the other book first (though personally, I would read Black Tides first anyway). I found that by contrast, The Descent of Monsters was very much settled within that now existing framework, and relied on prior knowledge of the other two novellas to orientate you and help you understand who means what to whom a Reviewed for The Bibliophibian. The first two books (The Red Threads of Fortune and The Black Tides of Heaven) introduce you to a world and a setting without making it essential to have read the other book first (though personally, I would read Black Tides first anyway). I found that by contrast, The Descent of Monsters was very much settled within that now existing framework, and relied on prior knowledge of the other two novellas to orientate you and help you understand who means what to whom and why, and why this character does x and y, etc. This is a bit different in format to the first two books as well, focusing on the investigations of a new character into events that Akeha and Mokoya are involved in, without giving us much access to the actual thoughts of Mokoya and Akeha (and the other characters we already know). Part of it is written as an investigation report: there are also letters and a couple of interrogation transcripts. Honestly, I found this not quite enough to re-orientate myself within the world. Before I read another book in this world, I think I might well make the time to reread these first three together, to make sure I understand all the nuances and how the events connect. I didn’t even read the first two books that long ago, but Yang doesn’t spoonfeed you (which is not a complaint! I think it’s reasonable to expect you to carry a certain amount of information between books, it’s just that apparently my brain is a sieve right now). This series is so brilliant. The Descent of Monsters is very different stylistically than the first two, both of which were very different from each other, but all three stories have been incredibly creative and well-written. This episode is told exclusively through written documentation of the investigation into a gruesome incident, which provides an interesting framing for the events and revelations that follow. The ending left me very, very impatient for book 4 in January. Where this series shines is its world building. JY has created a unique world that fascinates me every time I read this series. I really liked the combination of mystery with fantasy in Descent of Monsters and the way the story is told mostly through letters. Overall, my favorite book in this series. Excellent addition to the Tensorate series. I love the world that Yang has created as well as the characters. Each novella is told from a different point of view -- this variance adds a lot of richness to the stories. Looking forward to another release in this series later this year. Book no.4 isn't out for a few months yet, though I have read its first few chapters. The first three books have been terrific. It's epistolary fiction with outsider point of view: two of my favorite tropes. Add in the deft beginning effort to knot together threads (some of which I'd thought abandoned forever) from previous volumes, and of course I was hooked. I can't wait to see what Yang does next. I've dearly loved each book in this series, but this was the most exciting, action-packed, and compelling of all three. I strongly recommend all of them to those who love fantasy and science fiction, and characters with mysterious, magical gifts for manipulating reality. The third book is different from the first two primarily in that it's like an X-Files narrative: spooky terrible things have happened underground, and it is up to a gang of resourceful misfits to use their strange gifts to find T I've dearly loved each book in this series, but this was the most exciting, action-packed, and compelling of all three. I strongly recommend all of them to those who love fantasy and science fiction, and characters with mysterious, magical gifts for manipulating reality. The third book is different from the first two primarily in that it's like an X-Files narrative: spooky terrible things have happened underground, and it is up to a gang of resourceful misfits to use their strange gifts to find The Truth that is Out There. Every chapter puts together a bit more of the horrible conspiracy--much of the book is letters and transcriptions, which adds to the piecemeal manner in which the narrative is slowly constructed. Yang is very effective at building suspense and I turned pages like mad, dying to know what happened next. This book does feel like a bit of a departure from the first two: it's much faster, a lot more happens, and it's a grittier than the first two. I enjoyed the hell out of this read, so I'm not complaining. Although it does return to the characters you've known and loved in the first two books, they are no longer the protagonists. This new MC is, in my opinion, more of an everyperson--a sarcastic, swearing bureaucrat who hates their job, is pissed off at the powers that be, has no special powers or gifts, and is terrified of the whole situation. I like this character because I can see myself in them more than in the beautiful and gifted Akeha and Mokoya, for instance, as much as I love hearing about them. The world-building around Slack tradition is great: "The Slack" is an energy field that permeates all things and may be manipulated by a gifted few. It's like The Force, but more elemental, earth-based. I love the portrayal (mostly in book 2) of the differences between folk tradition and institutional education in Slackcraft. At the heart of this series, however, is the love you feel for the person you are closest to, and the heartbreak and loneliness of being separated from them. The characters in Yang's books are motivated entirely by that deep and raw love and grief, and they act on those feelings as foolishly and courageously as any of us do. It's wonderful. I would love to be friends with any of them. Like the other novellas in this series, I absolutely adore Yang's world-building and characters. They weave so many layers into a mere 170 pages--this world feels so deeply real, with such a complicated and violate history (and present). But unlike the fist two Tensorate novellas, this one didn't feel quite as whole and cohesive to me. It felt rushed, and more like an info dump than a story in its own right. Possibly because of the way it was written (a collection of journal entires, letters, re Like the other novellas in this series, I absolutely adore Yang's world-building and characters. They weave so many layers into a mere 170 pages--this world feels so deeply real, with such a complicated and violate history (and present). But unlike the fist two Tensorate novellas, this one didn't feel quite as whole and cohesive to me. It felt rushed, and more like an info dump than a story in its own right. Possibly because of the way it was written (a collection of journal entires, letters, reports, etc.) I found it hard to connect with the characters. It was all completely intriguing (and really brutal and gruesome), and I was never once bored by it. But it didn't exactly leave me satisfied, either. It felt like the beginning of a longer story, and I wanted the rest of it. There were so many moments I wanted to linger within, so may questions I wanted to delve deeper into, so many characters mentioned that I wanted more of. I didn't have this sense with the previous two novellas, which felt very deep and rich and complete, despite being short. J.Y. Yang has done it again. Their Tensorate series of novellas has quickly become one of my favorites and I was glad to see it continue with The Descent of Monsters. I’m finally all caught up in the series and ready for The Ascent to Godhood. One of the best things about The Descent of Monsters is that it brings in something new to the series. However, I’d like to repeat that while it can stand on its own, it’s best enjoyed after having read The Black Tides of Heaven and The Red Threads of Fortu J.Y. Yang has done it again. Their Tensorate series of novellas has quickly become one of my favorites and I was glad to see it continue with The Descent of Monsters. I’m finally all caught up in the series and ready for The Ascent to Godhood. One of the best things about The Descent of Monsters is that it brings in something new to the series. However, I’d like to repeat that while it can stand on its own, it’s best enjoyed after having read The Black Tides of Heaven and The Red Threads of Fortune. I loved how J.Y. Yang mixes things up in this book. Here, we follow Inspector Chuwan, a tensor who’s tasked with uncovering what happened in the Rewar Teng Institute. Only, it seems that there are forces at work bent on hampering her investigation. The Inspector now turns rogue in order to uncover the truth and in the process discovers more about the festering corruption in the heart of the Tensorate. In this book, we have Inspector Chuwan’s journal, letters, her report, as well as official documents such as a transcript of Rider’s interrogation. I liked the procedural feel in this story and how it’s simultaneously of a smaller scope while also showing us a bigger slice of how the Tensorate operates. As usual, J.Y. Yang’s world-building is tight and top-notch. Their writing is also a lot stronger in this novel and adds a lot to the procedural noir-ish feel. 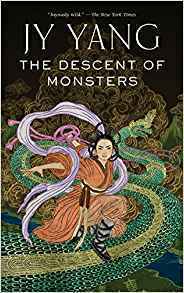 Overall, I really enjoyed The Descent of Monsters and I’ll be counting the days to The Ascent to Godhood. Okay. So that ending. Way to leave me needing the next one now. But I loved the epistolary style this one was done in. Oh man this one's tough. 3.5 stars? 4? I've no idea. Review to come!